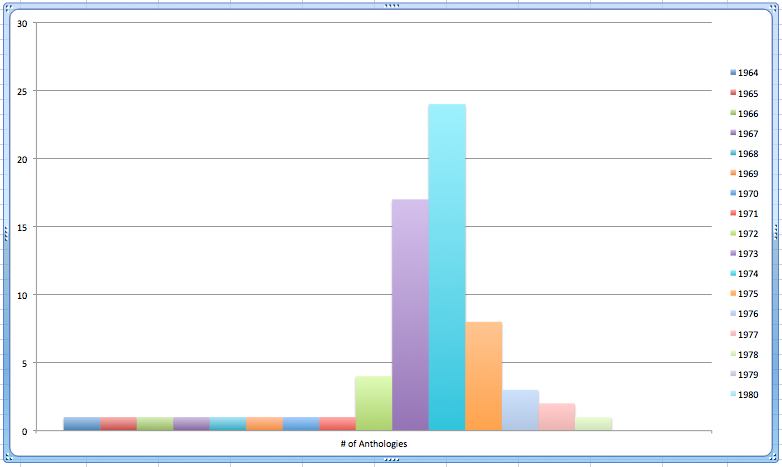 A brief introduction outlining the anthology’s premise. As far as I can tell, all of the stories were commissioned for this book. Or at least this was the first time they saw print. Determined not to repeat the errors of the past, a colony composed entirely of young adults sets down on an alien world. The natives know something the colonists have temporarily forgotten: sometimes old people know things that can be life or death to the young. The science in this is beyond daffy, with lunar tides causing rivers to stand on end. The kids seem nice enough (at least until they suffer serious setbacks, at which point they turn on each other). However, their decision to eschew all technology beyond muscle power was likely going to come back to bite them, even if local weirdness didn’t get them first. This doesn’t seem out of keeping with the experiences of all too many 1960s-era communes, if the one of which I had some experience was any indication. America’s luck came up snake-eyes in 1988. Half the nation died as unlikely calamities occurred with dreadful synergy. In the aftermath, the nation handed itself over to Mr. Nathan, whose Plan, he assured everyone, would give America the peace and prosperity it craved. A few Americans hide rebellion within the privacy of their minds, where the authorities cannot see it. Mr. Nathan has a plan to deal with that as well. The general trend of the stories is that the kids of tomorrow will be trapped in terrible worlds. This story is no exception. Premise: sufficiently advanced technology means that government indoctrination can be very effective. SFnal autocrats tend to be a lot more competent than the real world sorts. Mr. Nathan’s plan may be appalling, but it’s also producing its desired results. Faced with recidivist juvenile delinquents determined to race cars despite the legal and physical risks, the authorities try an innovative approach: give the kids exactly what they want, in spades. SFnal solutions to problems always seem to circle back to killing people, directly or otherwise. Born with a tragic genetic disability — average intelligence in a world of genetically enhanced geniuses — the norms struggle to convince the majority around them to provide the norms with the means to escape a world where they are viewed as a pitiful cripples. The norms are able to be extremely disruptive because they live in a highly connected world. Taking down the telecommunications of an entire nation is something a handful of not-especially-bright extremists can do (although in the end, sabotage mainly works as an attention-getting device). One wonders what disenchanted supergeniuses could do? It’s up to a few determined teens to keep a malevolent conservative from killing multitudes with poisoned drugs! To get back to the warning that I’ve received, you might take it with however many grains of salt you wish, that the brown acid that is circulating around us is not specifically too good. It’s suggested that you do stay away from that. Of course it’s your own trip, so be my guest. But be advised that there is a warning on that, okay? In this case, the drugs really are poison, but not because drugs are bad. It’s because there’s a mean old guy who is afraid people might have fun the wrong way. Squares can be real downers. A bright young man discovers a disquieting fact about a common food additive. Convinced the authorities know full well what’s in the food, he launches a covert research program to uncover the truth. Not, as it turns out, covert enough. And we’re back to Drugs Are Bad, as well as Gigantic Conspiracies Are Surprisingly Easy to Pull Off. It helps that this is a world teetering on the edge of becoming a panopticon state. Having accidentally invented a death ray of prodigious power, two young men must decide whether to conceal their discovery or share their knowledge with a world that will inevitably use it in war. Slight, but also legitimately dire. Determined to escape their cossetted existence, the teens discovered how terrible the world really is. The story’s tragic events start with the people raising the mutants, who decide to quarantine their charges, for fear that their talents and physical appearance will provoke hatred. As a consequence, the kids do not know much about the larger world, which seethes with homicidal xenophobes who never saw a deformed kid they wouldn’t kick to death. Poorly informed colonists on an alien world fail to understand the true nature of the natives with whom they share their new world. A number of stories feature attempts to shape the human gene pool: remove undesirable traits using genetic testing and targeted abortions. The protagonists of the stories are the kids who escaped abortion, so it’s understandable that they’re not keen on such methods. It is interesting that the methods are presented as being perfectly acceptable to the general population. Eugenics was everywhere back in the Disco Era. At his peak, Elwood was said to have represented a quarter of the market for short SF. His capacity to produce anthologies at high speed was not, alas, matched with an ability to produce interesting anthologies. The abrupt drop in the number of anthologies in 1975 may have been driven in part by Elwood’s acceptance of a position as editor of the (doomed) Laser Books line for Harlequin. It is also possible that readers, having read a few unremarkable Elwood anthologies, were reluctant to buy more. Or perhaps it’s that Elwood’s initial success had inspired imitators, who may have had better taste. Whatever the reason, Elwood stopped anthologizing and later left the SF field entirely. He had so definitively left that the news of his death took some time to reach the SF community. A fairly unsympathetic discussion of Elwood’s efforts may be found here. I note that Teresa Nielsen Hayden’s numbers are slightly different from mine, but the pattern is the same. Elwood’s anthology hooks, the themes that the stories share, aren’t that bad. In good hands, these might have sparked great stories. Too bad that Elwood chose lackluster stories. Even when he anthologized well-known authors, he often picked their sub-par work. This may in part have been due to the fact that most of the stories had appeared nowhere else. They were first published in the anthologies. No other editors, no fan acclaim, could influence Elwood’s unfortunate editorial judgment. As for this anthology: I observe only that it is just not so that the YA dystopias of our time are a new development. The Disco Era could be just as gloomy. 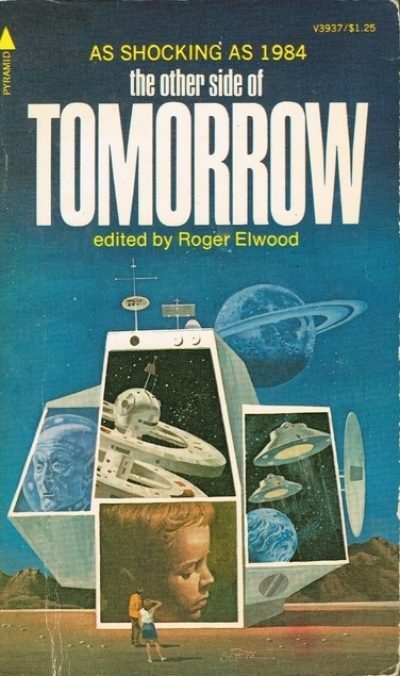 The Other Side of Tomorrow is out of print. Hmm. The lady says "carelessly edited", then goes on to imply that stories were acquired on terms commercially favourable to the editor. i.e. cheap. That certainly could include stories from noted authors already rejected elsewhere - we can speculate, anyway. I'm less convinced that one editor's output could kill sci-fi anthology as a, a thing, especially if it was a flock of turkeys that all had his name on the cover. You'd just avoid -his- anthologies. I suppose a fake name or a proxy would be possible, but even so?